FLIGBY is a leadership development game. Accordingly the aim is to achieve the best possible result as the leader of the Californian Turul Winery. If you do your job well and you make decisions strengthening the operation of the organization, at the end of the game the Winery will stand a chance of winning the “Spirit of the Wine Award”, a sign of international recognition. Your decisions made during the 23 scenes of the game are summarized and analyzed by a complex algorithm. If your leadership involvement facilitates the Flow state of your colleagues and it is also effective from the aspect of business, the Winery will win the award at the end of the game. You can become a member of the FLIGBY community easily and quickly. Only registered users can play the game. Registration can be done on the basis of email invitation received from your trainer or your FLIGBY consultant. Clicking on the link you find in the invitation email you can start registration. Your username will be the email address to which you received the registration email. It can’t be modified. From this time you can log in to the simulation with this username and a password chosen by you. The registration process finishes by accepting the Terms and Conditions. After registration you can reach the simulation any time on the website www.fligby.com clicking on the „Sign In” icon (the upper right corner). The game always continues from where you stopped last time. FLIGBY requires an adequate internet connection and a Flash-enabled web-browser to access its internet-based features, to authenticate your account and to perform gaming and learning functions. Find Adobe’s official Flash Player help center here! This interface is dominated by the video window. Events happen here: the story videos are played here and the decision options are also presented here. Full Screen Button – Full screen mode is worthwhile for a more complete game experience. Flow Trophies – If one of your virtual colleagues gets to Flow-state during the game, you will win a Flow Trophy. Collect as many as you can. Magic FLIGBY Button – Mr. Fligby’s task is to help your managerial work as an advisor/coach. If he has an opinion on the events, this button will be flashing. Click on it to see the video. Subtitle Field – To make things easier, all videos are subtitled. “Virtual Time” in the Story – The story lasts from March to November. You can always have a look at the current time here. Media Library – With this button you can open the Media Library for a quick reference at any time making the game stop automatically. Thus you have plenty of time to become absorbed in the different multimedia references and readings. When you return to the simulation the game continues where you stopped previously. Introduction videos available at any time (after Scene 1 is completed). Progress Bar Button – Plan and control the learning process. Here you can check exactly where you are in the game any time. The conscientious player can also check what percentage of the Media Library they have already processed. Help – You can find the brief description of the operation and functions of the game here. Pause/Play/Next Step Button – This is a double function button. On the one hand, you can move on after a certain exercise/Scene. On the other hand, if you play a video it functions as the classical Pause/Play button. There is a continuously available Media Library connected to the simulation with more than a hundred items. 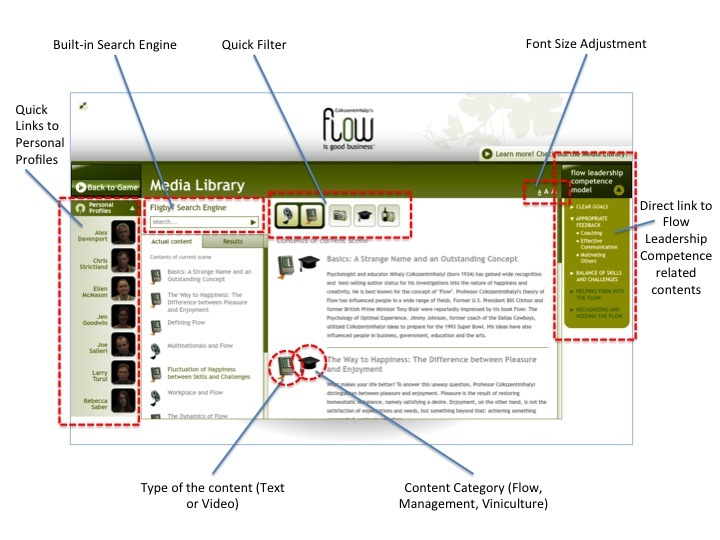 The purpose of this is to show the scientific and business background of Flow with the help of multimedia contents. The contents related to the plot of the game (e.g. the personal profiles of the characters, the detailed map of the Winery). When you enter the Media Library the game automatically stops. This enables you to look for practical help in the readings for any single decision. By quitting the Media Library the game restarts. When you return to the simulation the game continues where you stopped previously. In the default you can filter the search results simply with the help of built-in filters. The aim of the game is that your managerial decisions make your colleagues experience Flow-state, and as a result the business performance of the Turul Winery improves. The Flow-Gauge shows the effects of your decisions made during the game, therefore it is the most important feedback interface of the game. You can reach Flow-Gauge any time from the menu on the right side of the Main User Interface. When you enter the Flow-Gauge the game stops automatically. The central element of the Flow-Gauge is the Flow-Map, where you can continuously follow the characters’ current Flow-state. The theoretical base of the Flow-Map was created by Professor Csikszentmihályi. He and his colleagues have conducted several studies since the 1970s using a special experience sampling method. Flow-Map illustrates the result of the distribution of moods and emotion levels during certain activities throughout the day. The center is an average emotional state during the week; a balance of skills and challenges. As it is well-expected, in the field of optimal experience both skills and challenges are a bit higher than average. The top-right parts (Control and Arousal) are the closest to the Flow channel: a little increase of challenges or skills respectively will help to get to the optimal experience. The bottom-left corner, on the other hand, remains very far away from that optimum. Anxiety holds the most obstacles: all too often the gap between skills and high challenges seems impossible to leap across. It seems clear that reaching flow state is an advantageous achievement for your own good. However, it is impossible to be in Flow all the time. 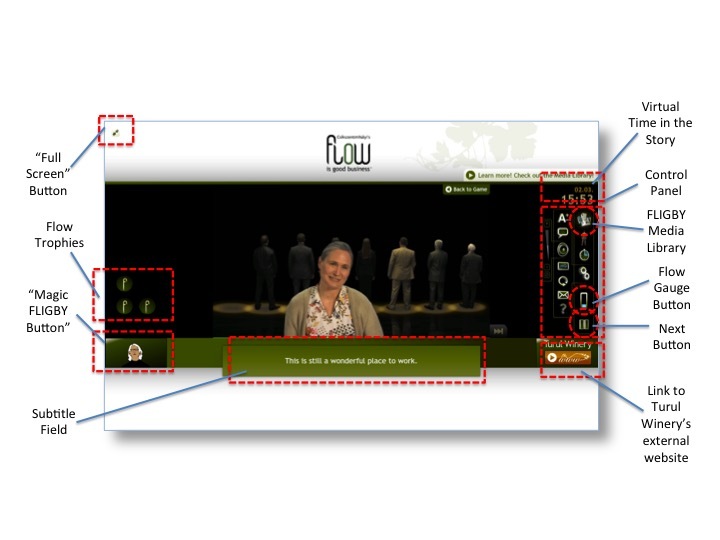 When a character gets into Flow-state as a consequence of your decisions, on the left side of the Main User Interface a Flow-Trophy appears. These Trophies can be continuously seen from the moment you won them until the end of the game, even if a particular colleague happens to lose the Flow-state in the meantime. Flow is a dynamically changing state, and in this regard the characters of the game are realistic: they won’t stay in Flow-state forever. If you restart the game, of course, you will lose all the Flow-Trophies you have won before the restart along with all the values and results obtained so far. In the event of mistakes in the decision making process, Mr. Fligby, the virtual coach of the simulation gives advice, holding back no punches. As the player’s personal consultant, he helps the interpretation and resolution of complex conflicts. The whole game can be evaluated on the basis of a single aspect: can you win the “Spirit of the Wine Award” and subsequently gain the international professional recognition for the management of Turul Winery? To win the award you have to make appropriate decisions regarding your colleagues’ motivation, the organization of teamwork, and the business as well. 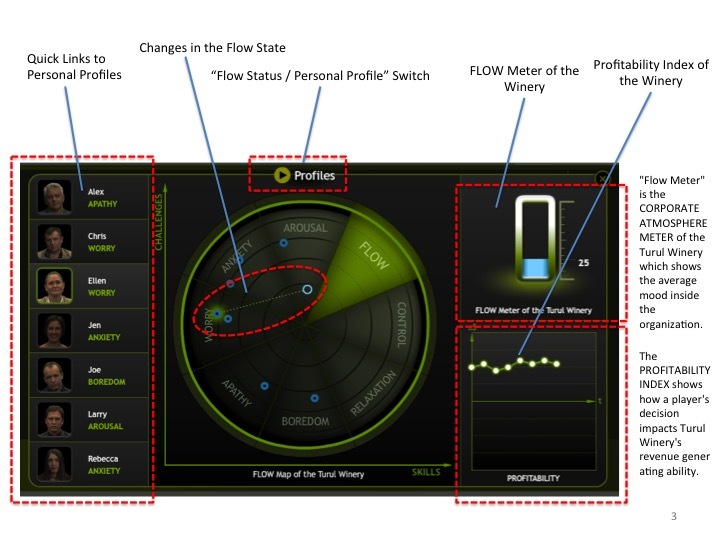 The player’s decisions are summarized by a complex algorithm taking into consideration the characters’ Flow-states, the values of the Flow-meter and those of the Profitability Index. Making some mistakes won’t result in losing the award, but to win the recognition you have to give a self-consistent and quality managerial performance. There are some decisions of high significance among the decision points of the game. These decisions can significantly increase or even decrease the values of Flow-Gauge compared to the normal decisions. We draw your attention to these Strategic Decision Points with an eye-catching yellow triangle up to the 11th Scene. With a bit of attention, this gives you the opportunity to be able to recognize the factors significantly influencing the events. Out of the 150 decision points of the game, more than 90 are strategic ones. This means that about 60% of the decisions affect significantly the outcome of the story. The choices you make in these Strategic Decision Points have a considerable influence on your chance of winning the “Spirit of the Wine Award”.